Yearning for some classics, I picked up my battered copy of Robert Heinlein’s Podkayne of Mars. 50 pages and an hour later I was working on a migraine, my sinuses were all messed up, and I felt queasy. this book STANK. I’d picked it up for pennies at an estate sale over the summer, and who knows how long it had sat in someone’s dark, dank, mildewy, moldy basement. A long, long time, according to my mucus membranes. Time to destink the stinky book! 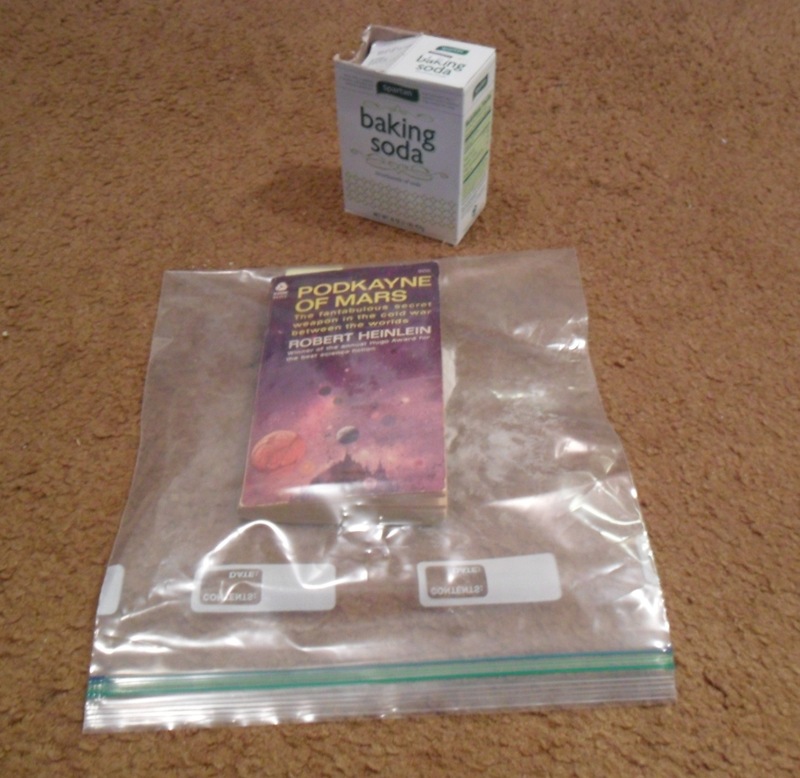 That’s three to four tablespoons of baking soda, sprinkled as evenly as possibly between the pages of the book. zipped up tight, leave for at least 24 hours. Do the smell test, and add more baking soda for another 24 hours as needed. The baking soda won’t take care of 100% of the funk, but it should take care of most of it. I did a sniff test after 8 hours, and although the book was certainly on its way to olifactory recovery, it had a ways to go. If your stinky book has decent binding (mine most certainly did not), open it all the way and fan out the pages. leave as fanned out as possible inside the bag. You can use a garbage bag as well, but I don’t suggest the grocery store plastic bags. While I’m waiting for the adorable Podkayne to destinkify, I picked up Guy Gavriel Kay’s Ysabel. Purchased brand spankin’ new last year, it smells like paper and ink and bookstore.